If you’re looking for a film about Stephen Hawking that deals a little more heavily with science and math then you should probably watch a documentary on the man. 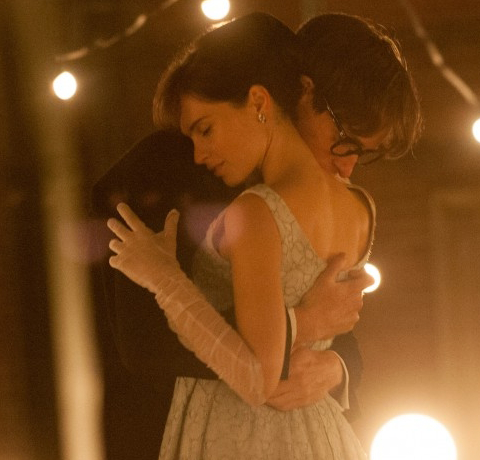 This film is concerned with the life and romantic struggles of the famed astrophysicist and churns out an interesting if not semi-vanilla biopic that is anchored by a great physical performance by Eddie Redmayne. The most interesting aspect of the film is definitely the physical transformation of the character as he gradually succumbs to ALS and the toll it takes on his life with his wife, Jane (Felicity Jones). I think the film is better served because it is based on the book written by Jane Hawking instead of an outside biographer. In this story we see imperfect people who deal with an immensely difficult situation the best they can, but we learn that a brilliant mind and a headstrong, intelligent woman can only handle so much. The film does a wonderful job of showing that being stricken with an ailment affects more than just the infected person, it spreads a wider circle of influence. The main issue I could point to is a lack of a compelling conflict. The world knows that Stephen Hawking has ALS and is still alive, so the disease poses no life threat in the film. We also know that he became a world renowned astrophysicist and is considered one of the greatest minds of our lifetime, so there is no tension in his scientific endeavors. And if you’ve read even the synopsis you know that his marriage to Jane does not last, so there’s no question as to whether their marriage will survive the incidents in the film. In this aspect it would be a story better suited to a documentary. That does not mean that there is an emotional divide between the film and the audience, quite the contrary. What is compelling in this narrative are the trials of Jane and the emotional state of Stephen as they deal with his physical decay and learn to cope with various medical instruments and unique inventions. As the film progresses you begin to feel the charm of these two characters and the sadness they both feel despite Stephen’s professional success, of which he owes much to Jane and her tireless help. There is a connection you can feel and it is sad to witness their professional and romantic trajectories diverge over time. There is a way of telling a story where the conclusion is foregone and somehow it is still compelling, but it is a rare feat. I think this film toes the line of accomplishing that but falls a little short. It is a nicely written, if not a little predictable in the way situations are set-up, and a beautifully photographed film featuring a great leading performance and a good female protagonist. And maybe that is all this film could be, especially considering the subject and the material available on him. While the film fails to attain the greatness of its subject, there is nothing wrong with hanging your hat on those positive attributes.